SAP HCM customers who are using the WebDynpro for ABAP (WD4A) user interface for E-Recruiting applications (delivered in EhP3 and EhP4), but are not yet using EhP5, have likely experienced a minor nuisance; SAP did not deliver a standard method to incorporate the Internal Candidate Start Page and Internal Job Search applications into the Employee Self Service (ESS). Bummer right? The good news is that this integration is delivered in EhP5. The great news is that there is a quick and easy way to make this integration happen before you upgrade to EhP5! I am commonly asked about this subject and fortunately can provide this simple solution based on my collective experience with ESS, the SAP Enterprise Portal and of course E-Recruiting. In my mind, the better solution is to deliver the Internal Candidate functions in ESS, where the bulk of employee-related HR transactions are delivered. This is easily achieved by using custom iViews, which directly call your WebDynpro E-Recruiting applications. This option is remarkably simple, fully supported by SAP, and allows for easy integration into your existing ESS roles. In plain terms, this approach is quick, easy, and intuitive for end users! Here’s the step-by-step – I am assuming that you have already created your customer-specific application and component configurations for your internal candidate start pages. Make sure that you are assigned the ‘Content Administrator’ role in the SAP Enterprise Portal. If you don’t know what this means, buddy up with your Portal administrator and ask for a brief introduction before you proceed. 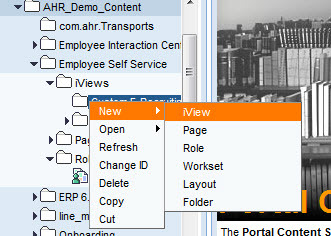 A wizard for creating an iView will appear in the working area of the Portal content directory. Choose to create an iView from a Web Dynpro ABAP application. Give your new iView a Name, ID and Prefix, then click ‘Next’. (Hint: If you are unsure about the appropriate naming conventions, check with your Portal team because they typically like the Portal content directory to remain neat and tidy!!!) Click ‘Next’. Add the WebDynpro application and configuration name of your customer-specific Internal Candidate Start Page to the iView parameters. In the ‘System’ and ‘Namespace’ fields, insert ‘SAP_ECC_ERecruiting’ and ‘SAP’, respectively. In the ‘Application Name’ and ‘Configuration Name’ fields, insert the name of the appropriate WebDynpro Application and Configuraiton name as per SE80, then click ‘Next’. On the next page, click the ‘Open for Editing’ check box so you can preview and adjust your new custom iView as needed. Click ‘Finish’. Note that to preview your iView, you want to make sure that you are set up as an internal candidate in the connected SAP_ECC_ERecruiting system. You likely already know that if you’re interested enough in this post to read this far! SNAP! You’ve now created a custom iView which can be integrated into your existing ESS roles. To Preview your iView, simply click the ‘Preview’ button on the Portal page – your iView will appear in a separate window. There are a host of options for calling this iView, from a Portal navigation perspective. While I could write an entire book on these navigation options, I’m just going to provide the following steps in keeping with the ‘Quick and Easy’ mantra of this approach. Essentially, what we have created here is the look and feel a customer would have expected SAP to have delivered as standard E-Recruiting integration to ESS. Stay tuned for more on how this integration works when you move to ESS on EP5! This entry was posted in Talk Techie to Me and tagged E-Recruiting, EHP4, EHP5, ESS, Portal, Talent Management. Bookmark the permalink.